Congregations of some United Reformed Churches may feel as if they’re rather isolated from other URCs, but few churches are more distant from other congregations in the federation than the United Reformed Church of Thunder Bay, ON. Even though the church is located in Ontario, the Thunder Bay congregation is part of Classis Western Canada since the closest URCNA congregation is Providence URC in Winnipeg, MN. And that is still about 450 miles (725 km) or an approximate nine-hour drive away. But the closest URC congregation in Ontario is almost twice that distance. Thunder Bay lies along the northwestern shore of Lake Superior and is approximately 800 miles (nearly 1300 km) or about a 16-hour drive from Grace URC of SimcoeCounty in Oro-Medonte (Classis Ontario East). In God’s providence, that is the congregation Thunder Bay’s new minister, Rev. Ancel Merwin, served before being installed at Thunder Bay on November 23, 2012. Rev. Richard Anjema, of Providence URC, flew from Winnipeg to Thunder Bay to conduct the installation service. Preaching from 1 Timothy 4:13-16 on “The Effective Ministry,” he reminded the congregation that the minister must be diligent and faithful while the congregation should respond with love, respect, and prayerful support. Rev. Ancel Merwin is a 2000 graduate of Mid-America Reformed Seminary and was ordained in 2001 at the Grace URC in Oro-Medonte, ON. Having served and grown close to that congregation for 12 years, it was painful for him and his family to leave the Grace family behind. He accepted the call to Thunder Bay on August 20, but had many opportunities for good-byes until his last Sunday on October 21. One of the most emotional for him was his last classis meeting, which was also the first meeting of Classis Ontario-East. Rev. 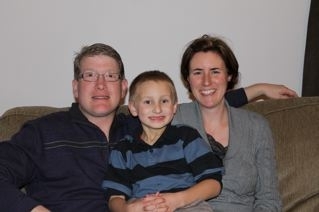 Merwin and his wife, Linda, have a son, Nathaniel, who is six. The Merwins arrived in Thunder Bay on October 30, after a two-day trip from Orillia traveling through wet snow and hazardous conditions just before the remnants of hurricane Sandy hit southern Ontario. Rev. Merwin’s first Sunday at Thunder Bay was November 4. The church consists of about 260 souls in over 60 families, which is more than double the size of Rev. Merwin’s previous congregation. Another challenge in their new location is its distance from family, especially Linda’s family in southern Ontario. But the Merwins feel blessed and comfortable in their new church home. The church building is located along Kings Hwy 130, just south of Hwy 11/17, west of Thunder Bay. Worship services are at 10:00 AM and 2:30 PM. The congregation organized and joined the URCNA in 2001 and was served by Rev. Barry Beukema until 2011. Although Thunder Bay is the most populous municipality in northwestern Ontario, the area is primarily a dairy farming community. The picturesque valley is surrounded by mountains and near scenic Lake Superior. A majority of URC families are farmers. The above article by Glenda Mathes appeared on page 13 of the February 6, 2013, issue of Christian Renewal.